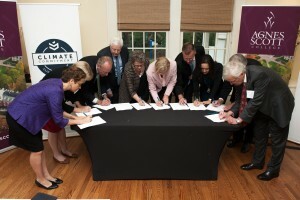 Bold commitments to climate action by higher education leaders have a significant impact at their institution and beyond. Presidents or Chancellors must sign one of the 3 commitments to join the network. 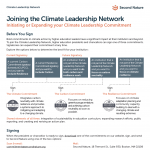 Click to download “Joining the Climate Leadership Network” pdf. We have developed resources to help you determine the best fit for your institution out of the 3 commitment options. 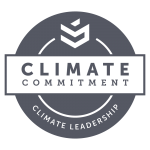 Climate Commitment: Integrates carbon neutrality with climate resilience and provides a systems approach to mitigating and adapting to a changing climate. Carbon Commitment: Focuses on reducing greenhouse gas emissions and achieving carbon neutrality as soon as possible. Resilience Commitment: Focuses on climate adaptation planning and community capacity building to deal with a changing climate and resulting extremes. Shared elements of all three commitments: integration of sustainability in education curriculum, expanding research efforts, public reporting, and creating and revising an action plan. Campus representatives may be interested in reviewing the overview of commitment implementation, comprehensive climate guidance, and informative webinars. Higher education cannot fulfill its obligation to support a thriving civil society if that society is not sustainable. Carbon neutrality provides an imperative and shared vision – that climate action and sustainability is central to higher education’s mission in the 21st century. More. The impacts of change are being felt worldwide, from Superstorm Sandy to the droughts in the Southwest. Campuses are already facing, and will continue to face, direct impacts from climate-related extreme events, and many are taking steps to increase tolerance to extremes such as drought or flooding. With a Resilience approach, we not only adapt, but flourish in the face of change while improving our local communities. More. 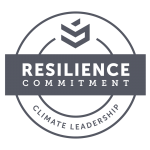 Learn more about the emerging topic of resilience and the Climate Leadership Network framework that is specifically designed for higher education. Download introductory handouts on what climate resilience is and why it’s important. Explore our U.S. Resilience Map, which lists the U.S. cities in the 100 Resilient Cities (100RC) network, and institutes that have resilience-related programs/initiatives. Why the Integrated Climate Commitment? By signing the integrated Climate Commitment, schools are creating plans that incorporate carbon neutrality and resilience, and work to include these in institutional planning. Sustainability (and sustainable thinking and planning) is about accounting for the complex and integrated nature of the variety of natural and human systems that maintain a thriving world. Isolating individual issues all too often results in actions that degrade overall sustainability while seeking to address a single aspect of it. More. Contact Second Nature to schedule a conversation or customized presentation to your senior staff, sustainability committee, and other stakeholder groups. Second Nature Climate Leadership Meeting, Agnes Scott College, Oct 5, 2015. Photo courtesy of Robert Hill.